BangBang and I were born in the same year and grew up in the bucolic city of Pasay. BangBang is a second-cousin whom I consider to be a super playmate. The most vivid memory I have with her is cooking “yema” (a Pinoy custard cream) in their kitchen (with the assistance of Ate Oye) whom we enjoyed eating one happy afternoon. 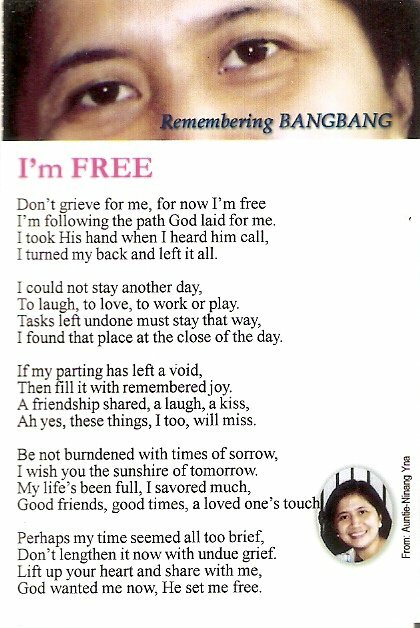 She may not be my closest cousin but I don’t remember any particular incident of having a disagreement with BangBang. Possessing the right amiable attitude I was actually never surprised to know that she became a fine young woman, a loving wife and an awesome caring mother.